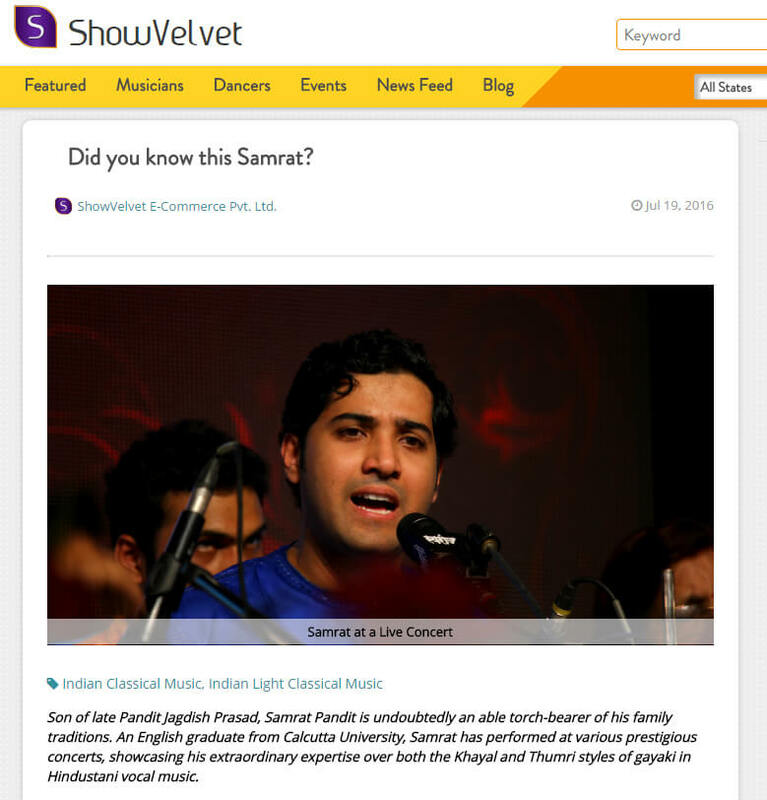 Interview : Did you know this Samrat ? When and how were you first introduced to music? Well, this is a tricky one. I was born in the centre of music only because my dad, my grandfather, my whole family, they all are musicians. The whole fraternity knows me by music since I was born in this family, my father being Jagdish Prasad. Also I had a passion for music since childhood. Did you always know that this is what you wanted to pursue? When did it become more than a hobby? It was always more than a hobby.I always knew this is what I wanted to do. This is what I was best at I guess. Well, basically I grew up listening to him. He was one of the bests in business and I loved the kind of music that he pursued. Not that I knew of this from birth, but as I grew up and listened to more music, I realised that this is what touches me the most. And also the gharana he belonged to (Patiala Gharana) is known for its soulful melody which really attracts me. Apart from your father, who are the other musicians whom you idolise? Of course I listen to Barkat Ali Khan Sahib, Ghulam Ali Khan Sahib, Bhimsen Joshi. I listen to a lot of instrumental music- Ustad Ali Akbar Khan Sahib, Pandit Ravi Shankar ji. I also listen to a lot of world musicians. What other forms of music are you into apart from Indian Classical? Apart from music, what are your other interests? I am an ex-boxer. I did a lot of physical activities. I still do yoga. I do a little bit of adventure sports, like mountain hiking and all. Coming back to classical music, as someone belonging to the present generation, how well do you think this generation has held on to its musical traditions? It’s doing pretty well I think. I have seen people of other generations, and for them there was much more luxury in life in the sense that there was not much pressure on them. And now people don’t have much time to groom themselves. That has somewhere taken a toll on the kind of music that we do I think, but then there are also amazing people around who have done great jobs, they are still young and they are doing absolutely fantastic. That’s amazing to see. How do you think classical music has evolved over the ages? disciples have stayed here, practised, and made it a part of their lives. I feel we have evolved a lot. There are a lot of recordings, internet, YouTube and this and that have helped. You can find anybody in the internet and get access to their music, but then it is after all a ‘Gurumukhi Vidya’. It has to be taught by the guru and you have to be living a very saintly life to get to the bottom of it. That’s how I feel, but it can vary from person to person. Of course there is an extra burden of the change of lifestyle that we have now, but then it’s normal. We are doing good I guess! You have been performing at other places as well. 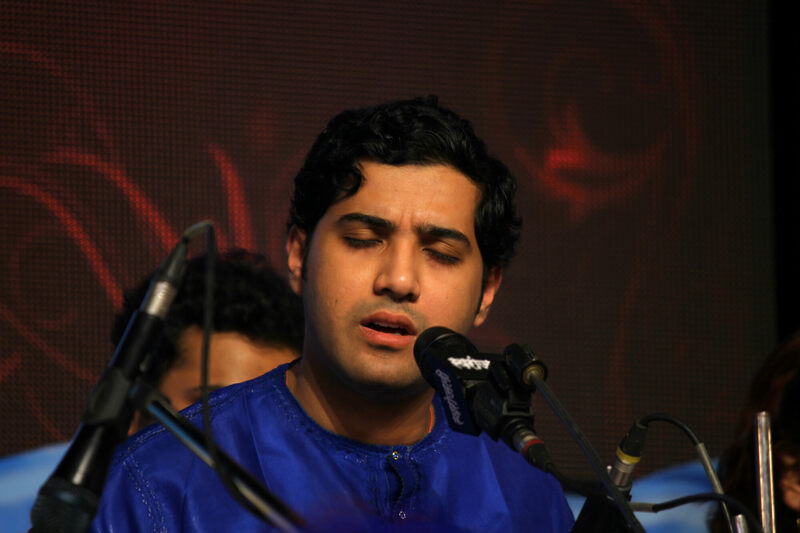 Is it a special feeling when you come back and perform at Kolkata? Majumdar), and then he his doing this part also, where he is taking care of the shows, trying to promote new talent. It’s absolutely fantastic. So every time I’m here I see such people and it’s very touching and it needs to be applauded, that’s what I would say. Speaking of performances, do you feel the audience needs to be formerly acquainted with the nuances of classical music to truly appreciate it or do you think it’s equally appealing to the common man? These are big questions you are asking (laughs). Well, I think people do need to be groomed a little. If they have some knowledge it’s more enjoyable and understandable. But if you speak of appeal, I would say when you hear a true voice I don’t think you need to distinguish the genre or go into the technicalities, it just touches your soul. But about the details, the raag-dari, all the knowledge and gyan, that needs to be taught. Apart from that, music is supposed to be enjoyed universally. How do you want yourself to be looked upon by others? I want to be looked upon as a musician, that’s it! And also as a friendly guy and a good human being, who served music without having to do with the commercial aspects and who did justice to his art. I should be able to justify my subject. How does it feel to be performing at Show Velvet Baithak on 24th July? of it and I am looking forward to it. Can I have a list of your favourites? Favourite musicians – I am very touched by my dad’s music. Lata Mangeshkar of course. If you go on asking, there are tonnes of other musicians whom I like. Dream Destination – I have already been to places like Paris, London. So it’s no more a dream. But I would really like to visit Corsica. Keep listening to good music, try to be a part of it. There’s more to come. Music is not done, it can never die. Be positive and be good!